How to boil an egg is an essential skill! Maybe you are planning to make deviled eggs or egg salad. Maybe you are planning to color Easter eggs. For all of these, you want perfect hard boiled eggs with creamy bright yellow yolks. Here's how to boil the perfect hard boiled egg. Place the egg(s) carefully in a small saucepan. Cover them with cool water. When the water comes to a full, rolling boil, with the bubbles breaking the surface, turn the heat down a bit. You want the water to boil gently: more than a simmer, but less than a full rolling boil. Set your timer for 12 minutes. When the time is up, immediately take the pan to the sink and carefully pour off the water. Run cold water from the tap over the eggs. Let the eggs sit in the cold water for a moment, and then pour off that water (which will have warmed already). Cover the eggs with cold water one more time. Let them sit for a few minutes until they are cool enough to handle. There you go: how to boil an egg! Here's how I remember how long to cook the eggs: eggs are generally sold by the dozen - so I cook them for a dozen (12) minutes! Can you skip the cold water step? No! Without the cold water, the eggs will continue to cook, even after hot water has been poured off. The yolks will begin to turn green or greyish. The exact cooking time will depend on a number of factors, including your altitude. Once you have tried this the first time, you'll know whether 12 minutes is exactly right for you. Maybe you want your yolks a bit more or less firm. Adjust the cooking time until you find the perfect answer, remember it, and you are set for life! Peeling hardboiled eggs can be a frustrating experience, especially if your eggs are very fresh. 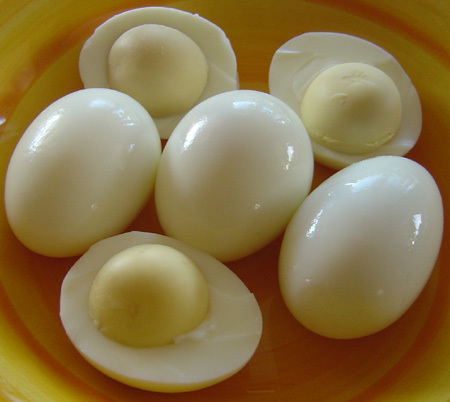 Here's a trick for how to peel hardboiled eggs that I learned from one of my readers. Now that you know how to make perfect hard boiled eggs, here are some recipes in which to use them! Return from how to boil an egg to egg recipes.